BMW continues its current luxury segment product offensive with the development of a further model variant of the new BMW 8 Series. With intensive function trials and test drives between Las Vegas and Death Valley in the USA, the critical phase in the series development for the new BMW 8 Series Convertible has now begun. The results of so-called hot climate testing in the Western United States provide important insights into the functional safety of mechanical and electronic components under extreme weather conditions. 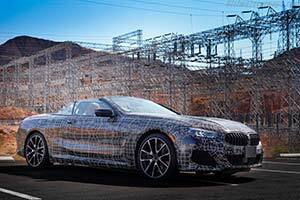 Temperatures of more than 50 degrees Celsius, extreme dust formation on the edge of the desert, stop-and-go traffic on the Las Vegas Strip, gravel tracks around Mount Whitney and long-distance journeys between the Pacific coast and the Rocky Mountains characterise the challenging test programme for the new BMW 8 Series Convertible on its way to series maturity. Weather conditions for a convertible definitely do not exist in Death Valley. However, the heat and the extreme dryness of the national park in the Mojave Desert do create the ideal conditions for an acid test of a special kind. Inside a prototype of the BMW 8 Series Convertible that has previously stood for hours in the blazing sun, BMW engineers check the onboard electronics, the hi-fi system, sensors and cameras for the driver assistant systems, displays for the new BMW Operating System 7.0, connectivity functions, seat adjustment and, at the very end, the automatic climate control. The camouflaged prototype's trip to the Hoover Dam poses an additional challenge to the vehicle's electronics. The exceptionally strong electromagnetic waves from the hydropower plant turbines installed there are the ultimate yardstick for the insensitivity of the electronic systems to external sources of interference. Furthermore, on endless tracks leading across the steppe and through the legendary Death Valley, the dust-proofness of the multi-layer soft-top and the roof mechanism are put to the test. The hardships suffered by testers and vehicle alike create the foundation for a new form of open-air enjoyment in the luxury segment. The new BMW 8 Series Convertible combines stylish elegance, exclusiveness and individuality with cutting edge equipment features in the areas of driver assistance, operation and networking. Moreover, the car's fascinating character is enhanced by high-quality drive and suspension technology with which the BMW 8 Series Coupe has already redefined sporty driving pleasure in the luxury segment. Hot climate testing has a similar level of significance for the series development of the new BMW 8 Series Convertible as has the programme at the Winter Testing Centre in Arjeplog, Sweden, as well as intensive test drives on the BMW Group proving ground in Miramas in Southern France and on the Nürburgring. Only when thousands of kilometres have finally been completed can developers rest assured that with the open-top model of the BMW 8 Series they are putting on the road a true dream car designed for the luxury segment.